Jason Campbell at Mary Eddy’s in OKC revs his way toward national recognition. With a name like Mary Eddy’s Kitchen x Lounge, today’s must-eat place in Oklahoma City, one might think that Mary is quite the restaurateur. But the actual driver of this eatery, found inside the old Ford Motor Co. assembly plant, is chef Jason Campbell. 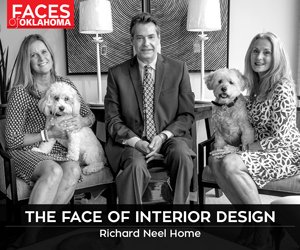 The late Mary Eddy Jones, the restaurant’s eponym, was the wife of Fred Jones, the legendary Oklahoma City and Tulsa automobile dealer. Mary Eddy’s is a nod to vehicular history in both name and location. Mary Eddy’s, sharing space in the old auto plant with the beautifully renovated, art-filled 21c Hotel, is a taste and site experience not to be missed, because Campbell has revved up new ideas during an already exciting time for OKC’s gastro-conscious diners. The 32-year-old native of Orlando, Florida, had introduced vibrant dishes for the 21c Hotel chain at its Cincinnati, Ohio, property as chef de cuisine before he got a figurative call: “Head south, young man, and do great things.” As executive chef for Mary Eddy’s and the OKC Hotel 21c, Campbell has the freedom to explore menu ideas and flavors that express himself. 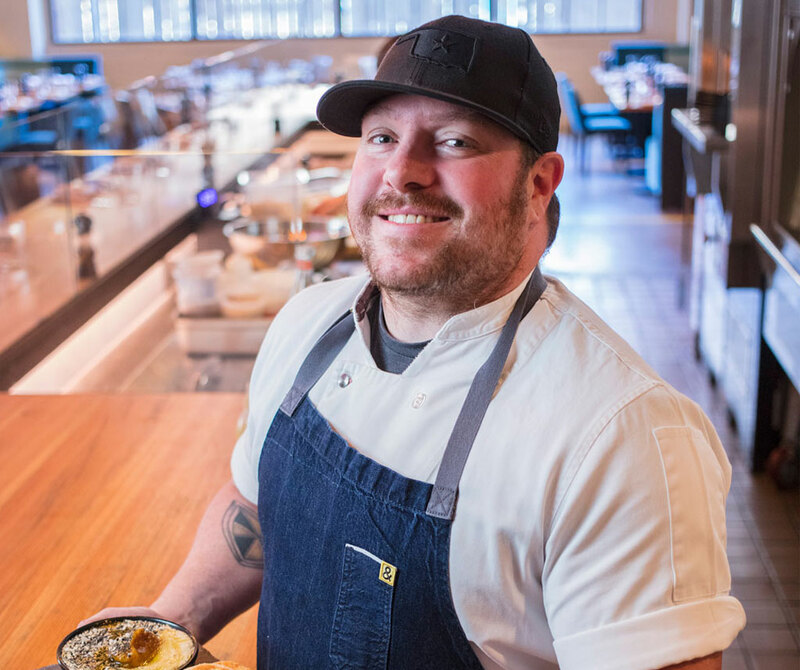 Menu items and house specials teem with abundant flavors from Moroccan, French, Greek influences that Campbell learned from chefs he has worked with. He also offers a personal touch from his southern and Florida roots when it comes to seafood and comfort food. Oklahoma City craves that kind of mold-breaking thinking from chefs. The city’s most creative, talented chefs thrive in this environment – and kudos to OKC for embracing new styles. 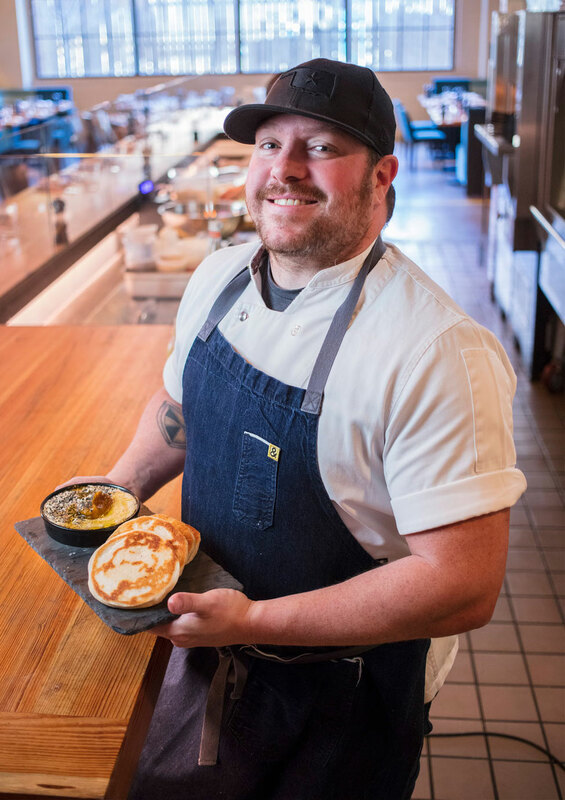 This OKC adopted son plans to continue growing Mary Eddy’s by training the best cooks and passing that love of food and creative talent forward. He will maintain involvement in the community, and maybe, just maybe, there might be a James Beard Award winner from Thunder City. Yes, 21c, this young man came back down south and has done great things. May he bring home the gold. Soak chickpeas in water overnight with 1 tsp. of the baking powder; make sure to double the amount of water to cover the chickpeas because they absorb water. Drain and rinse the peas the next day and place in a larger pot. Add the other teaspoon of baking powder. Cover with water (at least 4 inches above the peas), bring to a boil, skim any foam that comes to the top of the pot, reduce the heat to medium low, cover again and simmer for about 1 hour. Make sure the peas are completely tender, then cook for another 30 minutes; it’s OK if they get overcooked and mushy (it helps make the hummus creamy). Mix peas, tahini, salt and cumin in a food processor. Puree for 5 minutes or until super creamy; if needed, add a little water to help get it to proper texture. To serve, put hummus into a bowl, make a small indention in the hummus, add simple roasted squash puree, sprinkle with everything spice, and drizzle with burned honey. Eat with grilled pita, naan or crunchy vegetables. Pour honey in a high-sided sauce pot and put over medium heat, let come to a bubble and watch for the color to change to a light amber. Set side until cool, then place in airtight container. Mix all together, spread on cookie sheet or small pan and toast for 5 minutes in a 350-degree oven. Add to an airtight container once cooled (it will keep at room temperature for a week).